It’s likely that you and many of your clients have already started thinking about taxes. Unfortunately, another group is also getting ready for tax time: identity thieves. As you know, there’s a significant increase in the sharing of sensitive information—both online and via mail—during tax season. This presents an ideal opportunity for identity thieves to steal your clients’ personal information and possibly their identities. 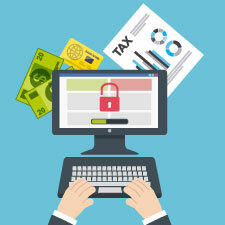 How can you help your clients avoid tax-related identity theft? You can start by understanding the problem and then educating yourself on possible solutions. With our free assessment tool, you can help your clients prepare for tax season (and beyond!). In short, tax-related identity theft is when a thief uses someone else’s social security number to file a fraudulent tax return and collect a refund. What happens when the real taxpayer files? He or she will receive a notice from the IRS stating that a return has already been submitted under that social security number. To make matters worse, if an identity thief beats your client to the punch and files a phony return using your client's information, the remediation process can take at least six months, and usually even longer. In today's tech-focused world, identity theft is a major problem. In 2016, many Americans fell victim to a major data breach. Their personal information was exposed, and identity thieves capitalized on the opportunity. For 2017, the IRS plans to implement more effective authentication features, including a new verification code on approximately 50 million W-2s. What are some other steps you can take to help your clients save the time and money wasted as a result of this all-too-common situation? Let’s look at the best ways to help them avoid it. 1) Early filing. The faster your clients get their taxes in, the less time an identity thief has to file a tax return in their name. 2) Security. If your clients file online, they should use only a secure Internet connection. If they file by mail, encourage them to bring their returns directly to the post office rather than just dropping them in the mailbox. 3) Document shredding. Any mail or other documents containing personal or financial data should be shredded. Thieves will stop at nothing to get this type of information—even rummaging through the trash! 4) Personal information. Whether online, over the phone, or by mail, your clients should never provide their personal information—unless they initiated the contact using a number they know belongs to the person or entity they intended to call. If they do receive a message asking for personal information, they should call that entity on a verified number to confirm the legitimacy of the request. 5) Theft protection services. Beyond typical credit monitoring, theft protection services can track personal information across the Internet and public databases. If suspicious activity is encountered, clients will be alerted. Further, an insurance policy will be provided to repair damage in the event that an identity is stolen. The IRS never contacts taxpayers via e-mail, and it very rarely contacts them by phone. If your client receives a mail notification from the IRS, he or she should call the local IRS branch for additional information. If your client does become a victim of identity theft, advise him or her to report it immediately to the Federal Trade Commission and to follow the steps at IdentityTheft.gov. For more information, including ways to reduce the risk of tax-related fraud, encourage your clients to visit the IRS’s Taxpayer Guide to Identity Theft. With these tips, you can help your clients protect their information not only at tax time but year-round. The most important thing to remember is that everyone needs to be vigilant about how and with whom sensitive information is shared. Have you or your clients been victims of tax-related identity theft? What steps have you taken to help your clients avoid this situation? Please share your thoughts with us below.